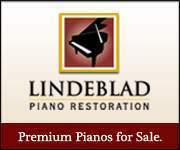 This is a rare opportunity to acquire an important piano. Garrick Ohlsson purchased this piano in 1983 and has used it for numerous recordings and live performances throughout the east coast. He fell in love with it when he first saw it in Toronto where it was used for concert service by the legendary piano technician Tom Hathaway. Live concerts include performances with Philadelphia Orchestra (Bartok 2nd Piano Concerto) and Boston Symphony (Tchaikovsky First Piano Concerto). Recordings include works by Chopin, Beethoven, Busoni, Liszt, Weber, Debussy, Wolpe and others. This piano has extraordinary tone and power and puts to rest the old chestnut about Bosendorfers being primarily chamber music pianos. 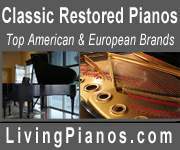 This exceptional piano has had extensive, high level maintenance, including new Bosendorfer hammers and restringing with Bosendorfer made bass strings. It is an great technical condition. The case, however, shows wear and tear customary of a traveling concert piano.